Toyota's venerable Tacoma has been a staple for pickup drivers since coming ashore in 1995. 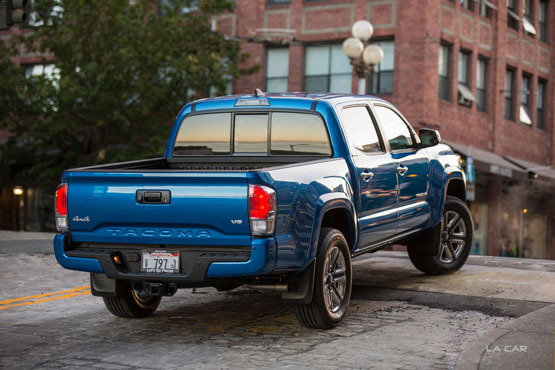 Originally wedged into the "compact" range, Tacoma now fits nicely into the "mid-sized" category. Whatever you decide to call it, Tacoma is a proven winner many times over. Toyota has modified Tacoma for 2016. Updates include a more pronounced front end assembly, new LED wraparound headlight arrangement, and grill. A lower chin spoiler helps direct airflow under the truck at highway speeds resulting in a quieter ride. Interior appointments include a newly designed dash and gauge cluster. Everything is where it should be and the switches generate positive tactile responses. A new 3.5-liter, 24-valve DOHC V6 produces 278hp and 265lb.-ft. of torque. The engine pulls steadily without effort but we found the engine/transmission tuning lacking in anything we'd call thrilling acceleration. This is doubtless the result of maximizing MPG ratings (19 street 24 highway). When rhomped on, the V6 exhibits a willingness to go though it showed itself tiresome to drive over undulating Woodland Hills terrain with upshifts in the 6-speed automatic coming much too soon and downshifts occurring only on heavy demand. The rugged Tacoma is tow rated at 6800 pounds. Trucks in general have adopted a more car-like ride and Toyota has done a fine job of bringing the 2016 Tacoma along. Cruising up the 101 and along Mulholland Highway was effortless and enjoyable. Our Premium JBL sound system was easy to use and I don't know how they did it, but hats off to the engineer who figured out how to minimize fingerprint smudges on the entertainment/navigation system. All interior pieces were tight, felt good, and were where they should be. Sounds simple, we know, but that's still overlooked and we're happy to report on the positive side. Our test truck has four seats though only the fronts are actually useable for people. Drivers over six feet tall will have to wiggle into position and will not be able to raise or lower the seat. Once in, the seats are accommodating, comfortable over long drives, with ample headroom. Folding down the rears gives loads of secure cargo room. 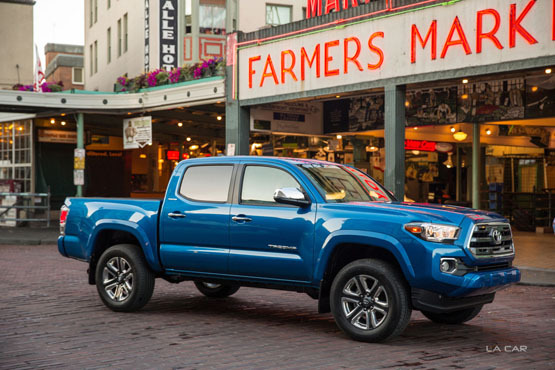 Given Toyota's record, it's safe to assume the 2016 Tacoma will outlast the average pickup on the market. Owners of older Tacomas we encountered during our test were impressed by the changes and all said they'd get another Tacoma when (if) their current one finally gives up the ghost. That kind of loyalty can only be bought over time. Toyota faced a tough road when upgrading to the 2016 Tacoma. An engineering battle cry of "It's not broke, we can fix it!" too often pervades our modern world. Tacoma is a proven platform with well-deserved and popular following. 2016 changes are for the better with an improved powerplant, interior design, and more aggressive external features. A Go-Pro camera mount comes standard on Tacoma and is stuck to the windshield. This bit of encouragement dares the owner to embark on an adventure, video the fun, and submit it to Toyota for broadcast. That's exactly the type of person this pickup is for. As Toyota says: "Lets go places." We came away impressed with the 2016 Toyota Tacoma. Those pickups are all over the place for good reason. 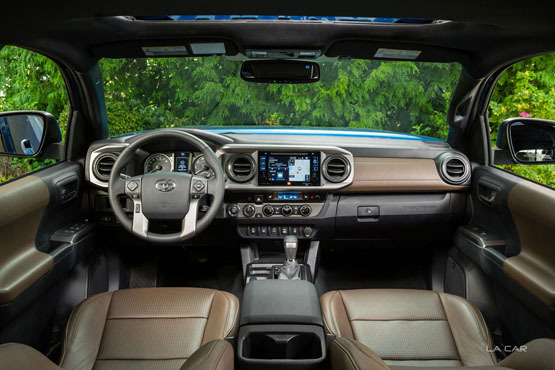 Though a bit of a tight fit for guys over six feet tall, average size people can expect to find a durable, comfortable, capable pickup in the Tacoma. As for Toyota, "average" is pretty big market.